The former thought experiment on Razaketh Tasigur is no longer one, but has first evolved into a solid control deck with a way above average win rate, and then into the state of the art decklist for control Tasigur. Still, there is some work to do, and some interaction to explore. However, the deck is functional at stopping everything that comes it's way, and is well tuned for Flash and Food Chain Metagame.It can grind like a madman with Seedborn Muse, and has some solid Tasigur -> Eldritch Evolution -> Razaketh -> Life//Death -> IsoRev lines. If you cant win outright, just dig up Nezahal instead, and you should be in a very favorable position. If one faces serious creature beats (which I don't), I recommend adding in Glacial Chasm (which does wonders when combined with Life from the Loam). Oh and yes, I cut both Timetwister and Necropotence; Timetwister refills my opponents (and more often than not hurts me) and Necro doesnt do enough. Cut Leyline if in a meta without much grave action. 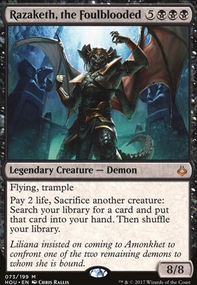 Thinking of replacing Season's Past or Regrowth with Eternat Witness, because I can dig up Seedborn From Ewit and dont lose my Tasigur as I would usually. Dont know yet if Priest of Titania is too good not to run. A small primer is in work, so don't despair!